Independence Baptist Church at the intersection of Highways 50 and 390, Independence. 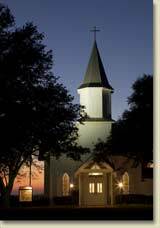 We invite you to take an evening tour of six architecturally-lit historic churches in the Independence neighborhood. 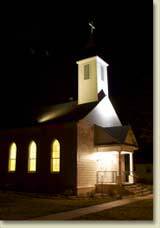 Inspired by the church-lighting program of St. John's Lutheran Church in Prairie Hill, five more churches were lit through the cooperative efforts of the Independence Preservation Trust, numerous donors, and the churches. 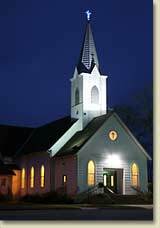 Once installed, each church has assumed responsibility for maintaining its lighting. 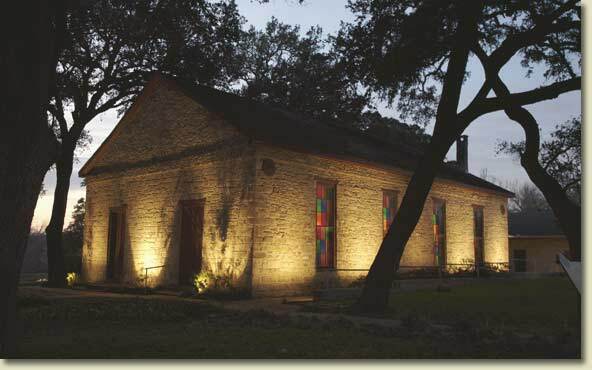 There are other lit historic sites to see when driving through Independence at night, including properties of the Independence Historical Society at Old Baylor Park, the Blanton Block, the Independence General Store, and the newest addition, Baylor Park on Windmill Hill. And note: Each year, Christmas lights in the Independence town center become more and more elaborate! in Independence, organized 1866, sanctuary built 1900. Independence Baptist Church, organized 1839, sanctuary built 1872. Bethlehem Lutheran Church in William Penn, organized 1860, sanctuary built 1893. St. Matthew Lutheran Church in Sandy Hill, organized 1891, sanctuary built 1916. St. John’s Lutheran Church in Prairie Hill, organized 1877, sanctuary built 1912. Immanuel Lutheran Church in Wiedeville, organized 1871, sanctuary built 1881. Click here to see night photos of Liberty Baptist Church in Independence and Bethlehem Lutheran Church in William Penn. 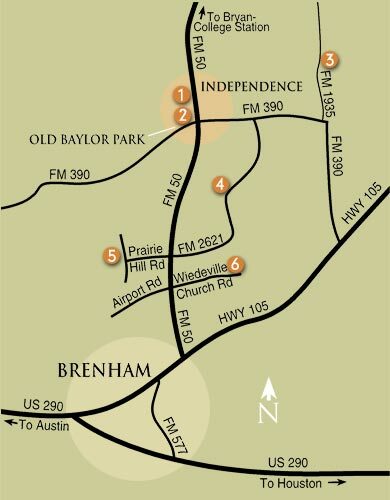 You can read about each of these communities in the Handbook of Texas Online. See Touring Independence for other historic sites in Independence. Photos: Scott Hill, Brenham Portrait Gallery.